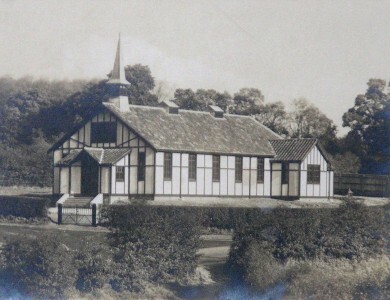 In the 1970s, St. Mary’s parish was combined with St. Paul’s parish, as St. Paul’s wooden church was well past its use-by date, and in need of major renovation. 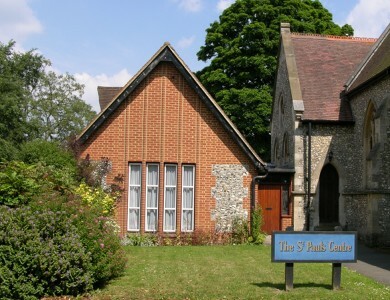 St. Paul’s church with its land was sold and the proceeds used to build the St. Paul’s Centre. The new building includes the Parish Office, a small hall, toilets and a kitchen area: it also provides a secure back entrance to the church. It is a valuable asset for the church. Several items were retained from the old St. Paul’s church and have been kept in St. Mary’s, including the altar, a wall hanging, and a triptych. The wall hanging is still hanging in the church, but the altar finally had to be discarded after standing in the North Aisle for many years. The triptych is mounted in the lobby area, over the door to the Office. It is a copy of three panels from an altar-piece, which are now in the National Gallery. 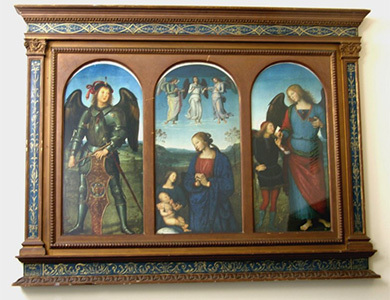 The centre panel is titled “Virgin and Child with an Angel” The left hand panel shows the Archangel Michael, and the right hand panel shows the Archangel Raphael with Tobias. The painter was Pietro Perugino (so named because he worked in Perugia in Italy) and he painted them around 1500. In 1480-82 he was in charge of the wall decoration of the Sistine Chapel in Rome.